Assassination Classroom Vol. 1 Review – AiPT! …however, this being is offering a chance for Earth to be saved with some rather bizarre demands. He wants to teach at a school for some reason and will not kill the Earth if the class he teaches can kill him first. Of course, this mysterious creature seems almost invincible, so that task may prove to be tricky. And so begins possibly the oddest and most out there premise for a series yet. Can this Junior High class made up of a bunch of students with terrible, low grades kill what appears to be this unstoppable alien force? The living emoticon looks so happy as he’s about to be shot to pieces.Now, with a premise like that, can this manga even work? It sounds so absurd that it might not. Surprisingly though, it can and does. So far, this holds up as a solid and enjoyable series. The first volume does a great job of setting up the initial premise of the series, establishing setting for the story, introducing Koro Sensei (that’s the name that the creature takes on), what he is like, and other various elements of the book. This volume really gives you a good idea of what to expect from the book and if this series will be up your alley or not. Assassination Classroom is, believe it or not, a comedy. Sure, the premise does imply this would be a rather dark and action-packed book, but that’s not what it primarily is (these elements are there, but the darkness is more of an background thing than something that exists in the forefront most of the time). The book is mostly about providing laughs and if absurd and wacky style comedy is your thing, this book definitely is for you. That’s where most of the humor comes from; the zany antics with Koro Sensei, how weird the situations are for the students, and the general goofy tone in contrast to the rather serious nature and gravity of the situation (like in one panel, Koro is helping a girl with math and she seems so happy as she’s learning and also trying to casually stab him with a knife). It’s a book with a rather specific type of humor, so if that’s not your cup of tea, you may not get into this book as much as others could. The weakest part of the series, at least so far, are the characters. Besides Koro Sensei and two other students, there’s not a whole lot of characterization and development going on here. We meet a few students and see some of their problems, but then they sort of fade into the background again once their chapter/focus story ends. There’s the government agent called Tadaomi Karasuma, who keeps the students informed on the dealings with the government and wants to help them train to take down Koro, but that’s kind of it. Other characters who would end up being regulars or get more focus later don’t really appear or only have a very small cameo, like the administrator. Otherwise, the supporting cast and a majority of the characters aren’t particularly memorable or well defined early on. On the plus side, he doesn’t have to spend much time on personal grooming today.There are two students that do get attention and development: Nagisa Shiota and Karma Akabane. Nagisa is sort of the character who we view the series through, always watching the situation unfold or being around for anything important that happens in the chapter involving Koro Sensei. He is a very weak character, though not without a few strengths. He doesn’t have much focus outside of being the person we see things happen through, but that’s more than almost everyone else. Then we have Karma, who surprisingly has a bit of depth to him. He’s a bit of a punk, having caused a lot of trouble in the past, and has a grudge against teachers in general. However, there is a reason for it (revealed in a flashback that adds character to him and also establishes the school quite a bit more) and he does have genuine positives traits, like standing up for other students in his class. Of all the students, he has the most depth and is most memorable. Then we have Koro Sensei himself and he is without doubt the best character of the entire book. Despite being kind of monster/alien thing, he’s very intelligent and a very capable teacher. Heck, considering how dedicated he is to teaching and how encouraging & helpful he is to his students, you almost wish there would be more teachers like him (minus the whole alien/blowing up the planet thing of course). He’s also rather funny and expressive despite his minimalistic looking face, providing the majority of the humor in the book. Of course, the series does a capable job of reminding the audience he is still a force of nature and rather intimidating when he wants to be. While he’s amusing and fun to read about, you never fully forget he’s the monster that blew up a chunk of the Moon and is threatening to destroy the entire Earth as well. The only other thing is that we don’t really learn much about his backstory, who he is, or where he came from outside of an intriguing flashback that lasted for less than a page. Hopefully we learn and see more in the coming volumes. Writing-wise, the volume is pretty solid overall. The pacing and story structure are solid, never feeling awkward in its transitions or moving at an odd speed. The dialogue and narration are pretty much fine, with plenty of good and amusing lines throughout. The tone of the book is odd, having a rather serious undercurrent to it that never really completely disappears despite the goofy and over the top nature of the book. It can be off putting for some who might not be able to buy into the comic as much because of it, but it doesn’t particularly bother me. The setting and area for the story, this entire school, are really interesting and feel fully alive. Throughout the book (and not in just one big info-dump), we learn a lot about this school and its policies, how other students react to E-3, and even how the teachers operate. It paints a rather harsh environment and adds a bit of drama on the school side of the story (not only does the class have to worry about Koro, but also their own grades as well). All of this stuff makes for a very unique and memorable experience. On the art side of things, Assassination Classroom is a well drawn manga. The layouts are very well done, making the book easy to follow and keep track of. This ultimately helps with the action, which is depicted nicely throughout. You can really feel the speed and energy in the characters’ movements and action, making for some pretty flash and memorable scenes or panels. The characters are decent looking so far, each looking distinct enough to tell apart. 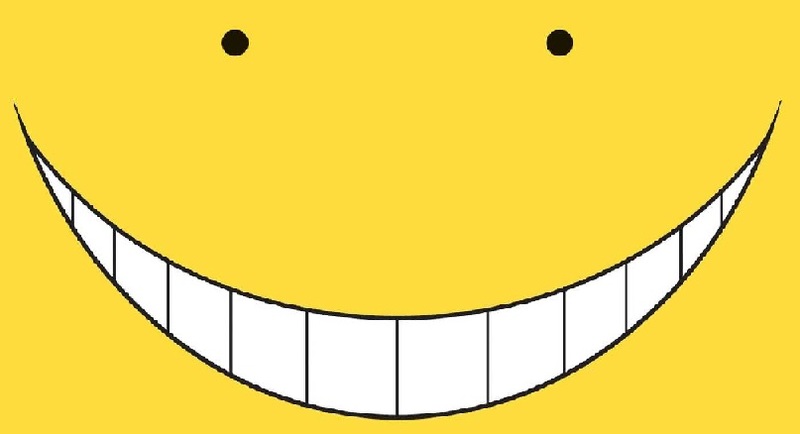 Koro Sensei is the best drawn of the cast and I do find it particularly impressive how much emotion the artist is able get out of him when he usually is just smiling and has two tiny dot eyes. Plus, the artwork is great also being able to capture how intimidating and threatening he can be despite how goofy looking he is (the use of angles, shadows, and similar). The only real weaknesses so far is that there are quite a few blank backgrounds that are just dull. Now that’s what I call pro multitasking. Studying for a big test and also trying your hand at assassination. Assassination Classroom Vol. 1 is probably one of the most unique and just plain different mangas to have come out all year long. It brings an interesting breath of fresh air to manga with its wild premise, memorable villain, silly antics, good writing, and dynamic artwork. It’s not something can be easily recommended to everyone because of its odd tone and premise in general, but if you want to read something completely different and not like anything you read before, I can highly recommend Assassination Classroom. Assassination Classroom is available from Amazon through Viz Media. The first volume is currently available for purchase, with the second volume set for release in February 2015. An anime adaption of the series is slated to start airing in January 2015, with a live action adaption currently in development. Believe it or not, a textbook based off this series was released back in August in Japan that was focused on teaching English. That’s certainly one interesting piece of merchandising you don’t usually see.